Last Saturday upon waking at our little cottage in the middle of Nowhere, Wisconsin, the weather was misty and the thermometer read a balmy 37 degrees. While typically I would have pulled up the blankets and slept the day away, I decided that would not do, not today. Instead, we all got dressed and hit the local farmers market. Normally, at the farmers market we look for ideas for dinner. But today, dinner this evening was to be provided by our good friends, the O’Connors. We just needed to come up with an idea for dessert. Everywhere I looked, I saw pumpkins. Big gourds, small gourds, decorative gourds. Gourds, gourds, gourds. You know what they say, right? 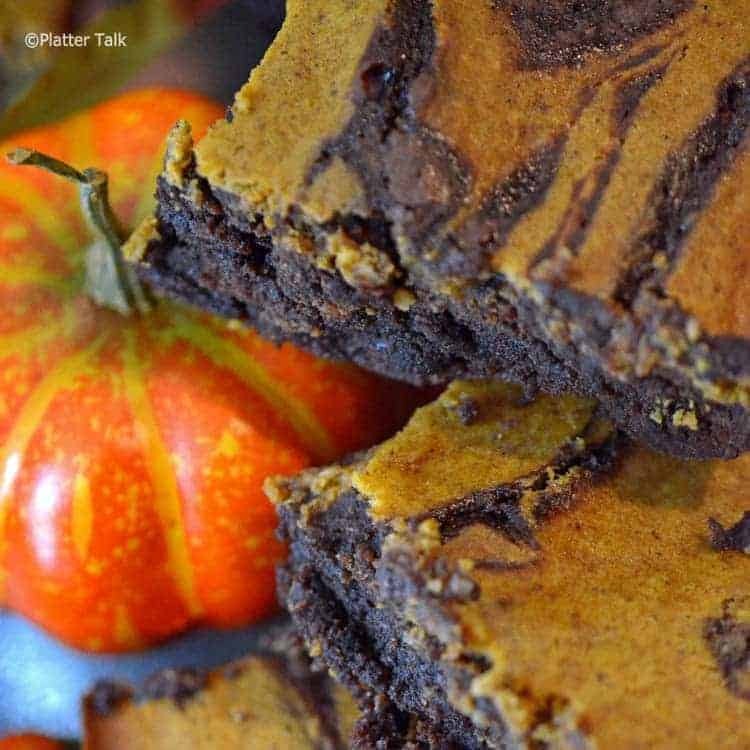 When handed a pumpkin, make pumpkin brownies. O.K., no one says that, but I am taking just a small amount of artistic license with the phrasing. Our cottage is very comfortable, but I have to say our kitchen at the cottage is not as well equipped as our kitchen at home. Don’t get me wrong, it is very nice. Because of this, I knew that I wanted to make this as easy as possible. Also, I did not want to spend my Saturday in the kitchen. Who does? I had a book calling my name. 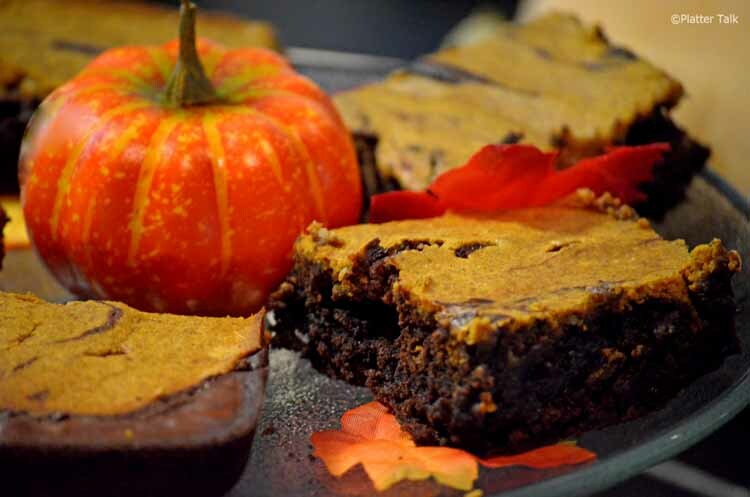 This recipe uses a standard boxed brownie mix and canned pumpkin. You really can’t get any easier than that. 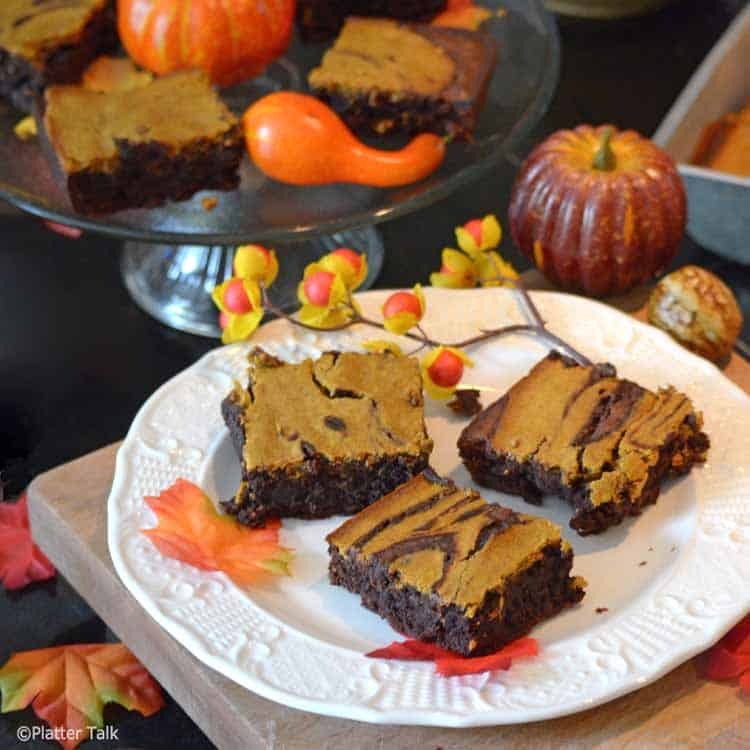 Mix in a couple of eggs here, some cream cheese there, some vegetable oil and a couple of other standard ingredients, which everyone has in their pantry and voila the pumpkin brownie was born. Quick and easy and ever so delicious. A great treat for the fall, or for anytime you need your chocolate and pumpkin fix. Heat oven to 350°F (325°F for dark or nonstick pan). Grease bottom only of 9-inch square pan with shortening or cooking spray. In small bowl, beat all filling ingredients with electric mixer on low speed until smooth. Set aside. Make brownie batter as directed on box, using ingredients as listed above. Spread 3/4 of the batter in pan. Spoon filling by tablespoonfuls evenly over batter. Spoon remaining brownie batter over filling. Cut through batter several times with knife for marbled design. Bake 40 to 45 minutes or until toothpick inserted 1 inch from side of pan comes out almost clean. Cool completely. Cut into 4 rows by 4 rows. If the batter is not spreadable enough for you, add another egg, or a bit more water, or a bit more oil so that the consistency better lends itself to being evenly distributed in the pan. Oh, just found this! 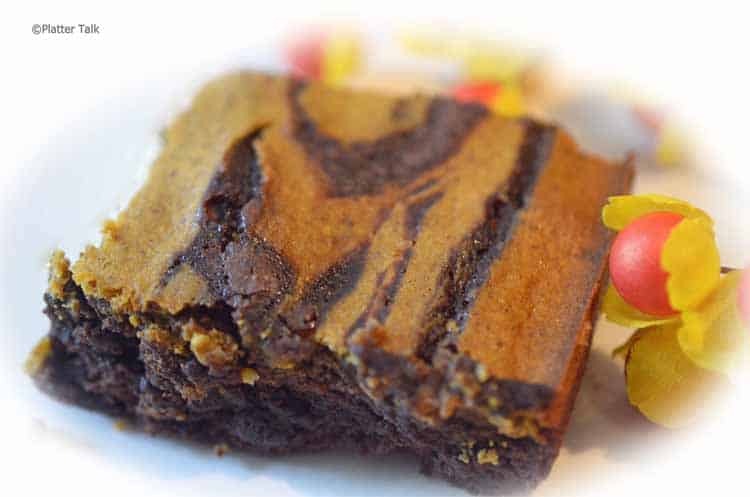 That swirl of pumpkin through the dark brownie sounds wonderful. And when my family had a cottage in the country, we stripped cooking down to be simple, too. Couldn’t really keep it stocked the way I do my home kitchen! Thanks, Anne. I think you will enjoy this, whether in the city or country! 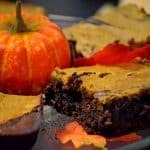 These sound divine, I love pairing chocolate and pumpkin together! Now this is a comforting fall dessert. Love it. Thanks for the great comments, Kim. I think your hubby will love you even more if you make these for him! These look delicious! I want to make these, but I’m a little confused about the directions for the brownie portion. Do I dump the two boxes of brownie mix in a bowl and add the ingredients you listed above? Or do I make the brownie mix according to the directions and combine the two batters to make one large batter using the instructions/ingredients on the brownie box? I’m so confused as I tried to make these the other night and the batter was so so thick, it was not spreadable at all. Thanks so much. When we made this recipe, we had the same question as you. In essence, Scott used all the ingredients as listed and as you experienced, he found the batter thick as well. Per Scott, if the batter is not spreadable enough for you, add another egg, or a bit more water, or a bit more oil so that the consistency better lends itself to being evenly distributed in the pan. That said, this batter is very thick. The brownies should come out as a dense and moist bar. We hope this explanation is helpful. This recipe and your question are good reminders that putting together great eats is not always an exact science but rather an art of sorts. Thanks so much for your question and feedback. These brownies look amazing! I’ll be sharing them on my FB page in my month- long pumpkin recipe collection. Thanks for sharing with us at Wake Up Wednesday! Thanks for your comments, and of course for hosting! These look awesome! I definitely need to try them. Found you on Say G’Day. Thanks for sharing! 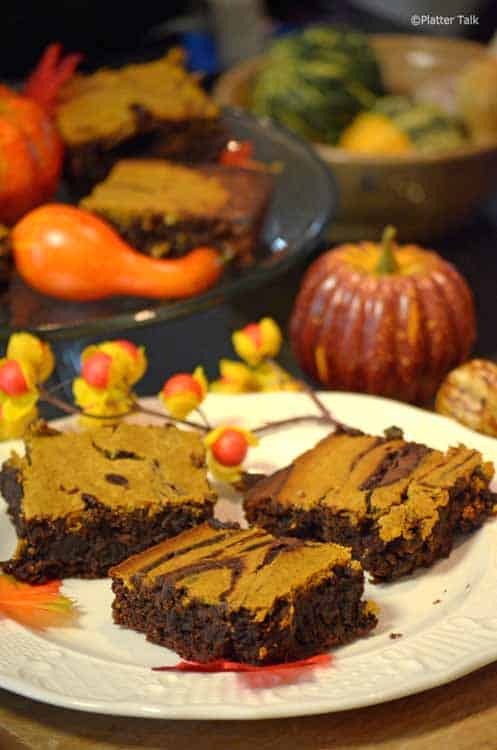 I love pumpkin brownies. I made some (without the cocoa/brownie mix – so actually a white brownie) and they were delicious! Can’t wait to try your version! Thanks for your commments, Elizabeth. I hope you try these! just wiping the drool from the corner of my mouth…these look DELICIOUS! Thank you, Audra. They were indeed all that. And more! Cheesecake and brownies together sounds great. I must try this! These look amazingly moist and delicious! Oh my, this looks delicious, I bet that cream cheese did it up good! I so want this in my holiday post. Patty, This will taste great on your holiday post!